The Epagneul Breton, also known as the Brittany originates from the French province of Bretagne, France. (Epagneul is a French word given to dogs that point or set their game, while a Breton is from Bretagne or Brittany). He is the national dog of France. In 1975 the Breton was introduced into Australia and has since developed a strong following among the hunting fraternity. Brittany’s/ Breton's are charming, gentle and personable members of the household. You would be hard-pressed to find a better family dog. Lively and fun, they are always up for a roll on the carpet, a game in the back yard or a cuddle on the couch. They are very happy, energetic dogs. Although the Breton was developed as an active hunting dog, it is also biddable and gentle, and almost placid in nature. Very good with children, they make a great family dog. Brittany’s are eager to please and easy to train. They are extremely loving and devoted to their owners. They are highly intelligent, sensitive by nature and will not tolerate harsh handling. The breed is characterised by "the maximum of quality in the minimum of size." Despite being a small, compact and elegant dog, it is noted for its endurance, stamina and tenacity. 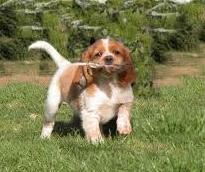 Although traditionally a hunting breed, the Brittany is equally at home in the obedience ring, performing agility, tracking and other dog sports. This breed will perform all day and be ready to go again and again. Keen, alert and intelligent, the Breton is overflowing with boundless energy. They are people-oriented dogs. They shouldn’t be left alone in the house or yard for long stretches of time. If they become bored or neglected, they might dig up the garden, chew furniture legs or get into all kinds of trouble. They are also very welcoming. They get along with everyone in the family, including children and other dogs. They reach up to 50cms tall, they weigh about 13-19 kgs, although they can be gluttons. Usually living to about 12 years but they can live up to 18 years old. The Breton is generally a very healthy breed, and our pups have all of the appropriate health checks and we offer a 100% money back guarantee with our pups. They are fairly easy to groom, with a short to medium coat and only shed once or twice a year.